Giselle Fernandez is savvy, witty and simply ravishing, with a 10,000-megawatt smile that has Hollywood written all over it. As co-host of NBC's "Access Hollywood," she's the source for all the news surrounding the biggest stars, from the upcoming blockbuster movies to the latest romances brewing off-screen. One day she's interviewing George Clooney about donning the Batman costume again, another she's covering the Oscars -- in a floor-length evening gown, no less -- and later she's swashbuckling across the television screen with Antonio Banderas for a story about his new movie, "The Mask of Zorro." It's all in a day's work for the 37-year-old Fernandez, a self-professed health nut who manages to squeeze a 30 to 45-minute cardiovascular workout and a brisk run into her schedule four times a week. "People can look beautiful, look thin and not be healthy at all. For me, it's not all aesthetic anymore," Fernandez said. "There is a trend, believe it or not, in the 'plastic surgery, image-is-everything' Hollywood toward inner fitness. You hear a lot about these mind-body-soul workouts -- Madonna going toward power yoga and meditation, and a lot of the Middle Eastern body-calming practices are coming to the front and center of Hollywood." Fernandez's healthy appearance and inner beauty have kept her on the fast track in the television news industry since her humble beginning out of college. After graduation from Sacramento State University, she mailed 100 demo tapes to stations all over the country and received 99 rejections. The only station interested in the "diamond in the rough" was KRDO-TV in Colorado Springs, Colorado, where she started her career as a camera operator/reporter/producer for the station's bureau in nearby Pueblo. It didn't take other stations long, however, to notice the Latin-born Fernandez's work and talent. Like many in television news, Fernandez worked at large- market stations in Los Angeles, Chicago and Miami before receiving her big break with one of the major networks. In October 1991, CBS hired her to contribute stories for programs such as "48 Hours," "Face the Nation" and "CBS Sunday Morning." She kept working her way up the network ladder and eventually served as substitute anchor for Dan Rather on "CBS Evening News." After four years with CBS, Fernandez jumped to rival NBC as substitute anchor for Tom Brokaw on "NBC Nightly News." She also substituted for hosts on "The Today Show" and was co- host for the popular morning program's weekend edition. During her career in hard news, she received five Emmy awards, including one for her live coverage of a Scud missile attack during the Persian Gulf War. Fernandez covered the Haiti and Panama invasions, the Somalian and Bosnian wars, the World Trade Center and Oklahoma City bombings and the Cuban immigration crisis. She was the first reporter in 20 years to interview Cuban dictator Fidel Castro in English. Fernandez was one of the top up-and-coming personalities in the network news industry. But her career path took an unexpected turn when she accepted her current job with "Access Hollywood," a half-hour, entertainment news program that runs on NBC stations throughout the country. Fernandez, a stranger to Hollywood, was hired to anchor the syndicated show in its first season. After struggling initially, the show's popularity has continued to increase, and it has been renewed for a third season. "I once asked Lyle Lovett, one of my favorite singers, 'Lyle, you're really hard to pin down. Are you country, are you jazz, are you blues, are you rock?" He said to me, 'Giselle, why do you have a need to qualify me? Why do people have a need to put me in any one category? Can't I be all of it?' I almost kicked myself because I can so relate," Fernandez said. "We're so intent in our society to box people in -- 'oh, you're just an entertainment reporter' or 'you're just a news reporter.' We all have many facets, hobbies and interests, and they all can become part of our professional life, if we're open enough and daring enough to pursue and try them." Taking Lovett's advice, Fernandez started "Cafe Ole with Giselle Fernandez," an intimate one-on-one talk show featuring celebrity guests from the worlds of music, film and television, in addition to her co-host duties with "Access Hollywood." It's the first show in English aired on the Spanish cable network, Galavision Si TV. 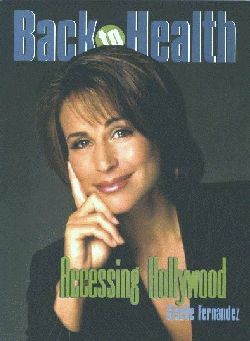 She also makes appearances as a television reporter on the NBC soap opera "Sunset Beach," and she played a reporter in the Hollywood movie "Wag the Dog." "Life is a series of a billion doors. If you're lucky and you're daring enough to see what you've got, you'll open each and every one," Fernandez said. "I don't know if I can do a comedy routine any more than I can cry on cue or succeed at any of these acting opportunities. I'll jump at the chance to experiment any chance I get." Fernandez wasn't always the adventurous, athletic woman she is now. Growing up, she battled weight, always trying to lose another 5 or 10 pounds. As she's gotten older -- in her 20s and now into her late 30s -- she's become more and more athletic, spending time running, hiking and, most recently, taking jazz dance lessons. Fernandez grew up in a dancing family; her father was a Mexican flamenco dancer and her mother danced in his company. "I love the outdoors. I love to run. It gives me time to think, and I believe I get the best workout possible. That kind of exercise really changed my whole physique," said the 5-foot-7-inch Mexico City native. "I'm one of the lucky people on the planet -- I build muscle and I tone very quickly. And I really enjoy the benefits of being fit and active." Unlike some Hollywood stars, Fernandez doesn't work out four hours or more a day. She divides her small amount of free time between her passions of reading and writing and spending time with her border collies. She relates her workout routine to brushing her teeth or taking a shower every day; it's a part of life. If she misses a morning run, she'll make it up later that evening or on the weekend. "I really believe in the life strategy of nutrition that advocates eating as many leafy greens, vegetables, fruits, grains and protein as possible. These foods not only keep you really fit, healthy and young, but they also fight cancers and heart disease. I really believe in that. I eat more broccoli now than I ever have in my life, and I absolutely love it!" Fernandez one day would like to open the Flat Belly Deli, serving only healthy and natural foods. Her weakness always has been french fries, so now she seasons and bakes potato strips, swearing they taste the same and, perhaps, even better. Plus, she claims they're healthy. Fernandez wants to share her favorite recipes and research through the Flat Belly Deli, complete with calorie and fat counts for every item on the menu. "I used to sit there and think, 'Why does everything that tastes good have to be bad for you? Why can't I love butter?' I love spaghetti and meat sauce, and I love doughnuts and candy and chocolate and buttered popcorn -- all those things that are sinful. As I've gotten more wise and savvy about being healthy, I've realized that you don't have to give up any of these things. If you're just a little smart and a little creative, you can have all the things you really love. You just have to learn to prepare them in a really healthy way." For now Fernandez is putting her culinary career on hold as well as her career as a jazz dancer. "When the Latin version of Alvin Ailey comes to town and they need a brown- skinned Latin dancer to play one of the nutcrackers, I'll be there," Fernandez said, laughing. "For me the goal is to have beautiful skin and a wonderful sense of calm, brightness in my eyes and to be healthy and beautiful, all combined into one. There is pressure, yeah, to fit into the glamour dresses and to look good in front of the camera, but it's more of an intensity, a drive, a desire to look good from the inside out." Copyright © 1998 CYBEX International. All rights reserved.